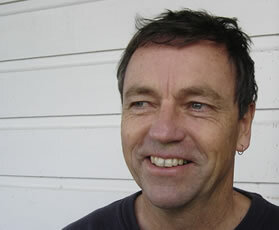 David Chadwick is a writer and musician from Te Horo on the Kapiti Coast. His poems have appeared in several publications, including Poetry NZ, Coastlines, The School Magazine (Australia), and The Junior Journal. In 2012 he won the Friends of Kapiti Libraries poetry competition. His prose writing includes Shaking, a novel for young adults. As a musician, David plays in a number of bands and also appears as a solo performer. He has recorded programmes of original songs for Radio NZ and released a self-produced CD, The Hard Edge. He is currently working at combining his poetry with his musical performances. are published in New Dialogues and New Beginnings- Poetry Anthology 2013.